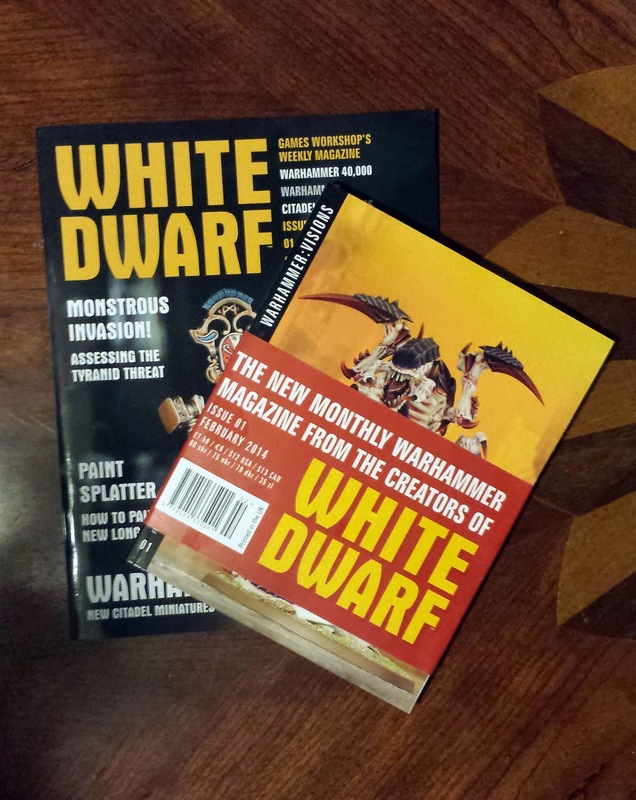 Doesn't it feel like just yesterday that we were all a-titter over the new White Dwarf? And here we are again with new New White Dwarf. As you've probably heard, the magazine has now been split into two separate items that are on different release schedules. 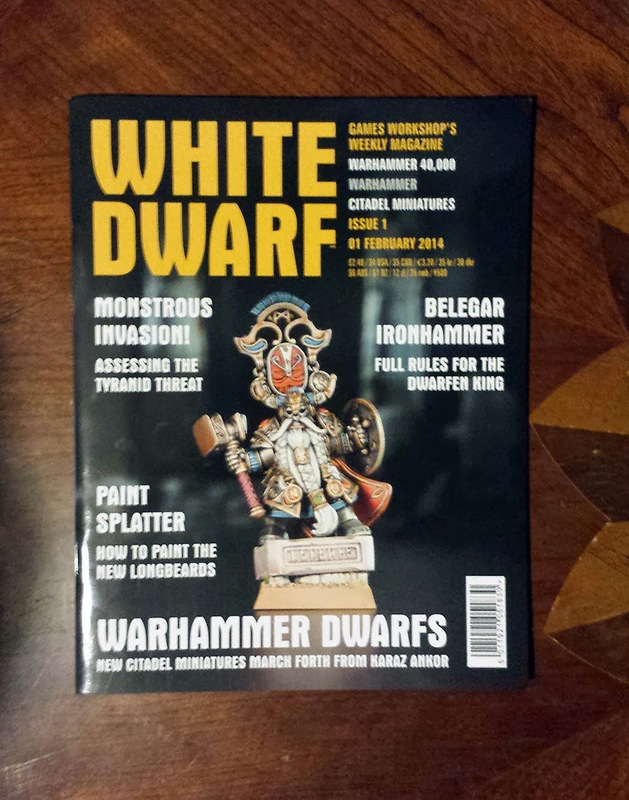 White Dwarf features a host of articles, from new releases and painting tips, to rules discussions and gaming advice. We really have crammed every page to bursting point. The great news is that there will be a new issue every week, available for the same price as a pot of Citadel Paint and keeping you up to date with everything going on in the hobby. Warhammer: Visions is a visual extravaganza, a real feast for your hobby eyes. With 50 pages of Golden Demon entries in this issue alone, it’s a great way to find inspiration for new projects and see all the latest models. A weekly little White Dwarf that seems, as described, to be the exact same White Dwarf we'd been getting, only broken up into 4 smaller ones released each week. They also seem to have done away with the subscription model entirely for this one- but anyone currently subscribed will automatically begin receiving Visions instead. This does bring up an interesting question- what happens to the annual White Dwarf subscription model? It seems that now anyone can buy him on the GW website for $35. And I think I have to, because he's a bloody vampire hunter this year. S. O. L. D.
So how do these two new magazines stack up? Well, I dusted off my December 2012 copy of WD (Hobbit release) and sat down to look at them together. First, we'll look at the White Dwarf Weekly. It'll set you back "as much as a pot of paint" or $4. Seems reasonable so far, although the magazine is only 32 pages, as compared to the ~140 pages of the original. So even buying all 4, you're still getting a bit less content for a few more dollars. But it is, unsurprisingly, exactly the same magazine as before, simply sliced into a smaller bit- many of the usual suspects are there- various new releases, Paint Splatter, Jervis Johnson, and designers notes. Some of the missing sections make an appearance in Visions, but I also imagine that the sections will rotate in as new issues of WDW come out. There's not really much else to say here- if you liked WD before, you'll probably like this, even though you have to physically go to your store to get it or buy it digitally each week (no subscription option, remember). Now onto the big beefy, Warhammer: Visions. This baby costs $12 but clocks in at 228 pages. Interestingly, it, too has a section on new releases (Tyranids, in case the cover wasn't a hint) as well as some Hobbit goodies. It also includes some of the WD regulars such as Army of the Month, Parade Ground, Kit Bash, Blanchitsu, and another Paint Splatter. It also features some Forgeworld models. Interestingly, nearly all of the text is featured in English, French, and German. Very first is the Tyranids feature. There's a really nice fold-out spread of Tyranids vs. Ultramarines. Honestly, if they're going for inspirational, this section really aced it. It, of course, features new models, but it also showcases the old ones, too, and there are a lot of close up, detailed photos to inspire that part of you that screams OMGMUSTPAINT. The whole first 50 pages is just that, it's great. Even better? No prices, no model descriptions, just lovely photos and a bit of fluff. They really are trying to show off the piece, not shill it. It moves into The Hobbit minis and some gorgeous Forgeworld minis in the same manor. Great, detailed photos with descriptions. And those Alpha Legion Terminators? Swoon. The Army of the Month was really awesome, it featured a Vampire Counts army which included ghostly Fenrisian wolves. Too cool. Let me not forget to mention how gorgeously painted it is, either. Again, they've hit the nail on the head with inspiration. It's a well painted army, but one that makes you think "I could be that good with practice" rather than, "Better just throw out my brushes". There's a hard balance to strike between inspirational and discouraging sometimes, and WD has always been good about falling on the right side of it. I am please to see that continues. Next, though, is the Golden Daemon feature. Most are amazing, a few are amazing to the point that your brushes are in danger. This is what you'd expect from such a high level of competition and I enjoy seeing what people come up with- even though I know I'll never paint that well. I've found that I get my best basing inspiration from models in competition like this. I like the kit bash, but I feel like everytime I pick up a WD, it's an Ork kit bash. That's kind of cheating. The entire Ork philosophy is centered around bashing found things together. I'd like to see some that aren't vehicles either. 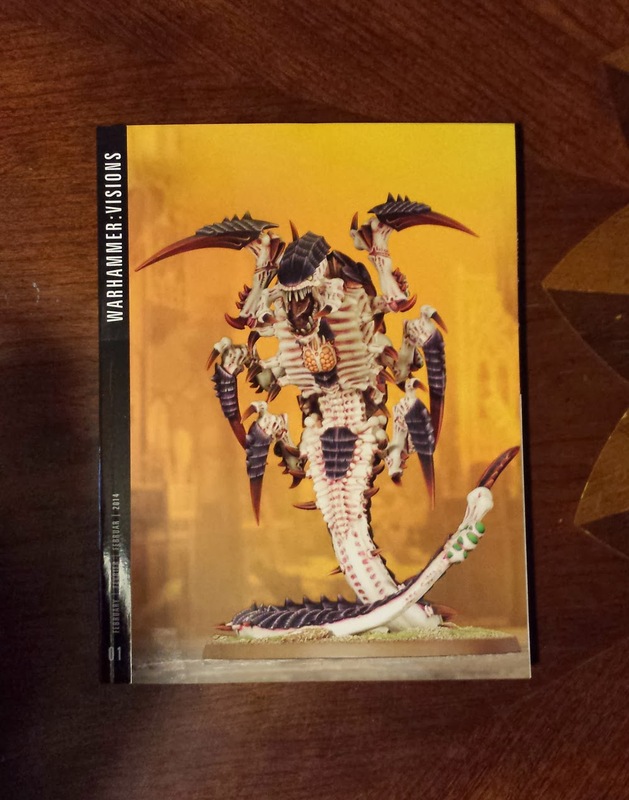 The Hive Fleet section was great because it showed off more Tyranids (i.e. older models) but also showed them off in the other Hive Fleet color schemes. I'm not crazy about Leviathan, so it's nice to see other featured as well. It was cool of them to show that neat carapace painting trick in the Paint Splatter, too. They show techniques for Kraken, Behemoth, and Leviathan, which is really fun. That pretty much takes us to the end- where they featured a teaser photo of some High Elves. So, it seems like we have that to look forward to next month! Overall, I'm pretty please with Visions. It got a little pricier compared to the WD but it has great content, and isn't hell-bent on selling anything to us. 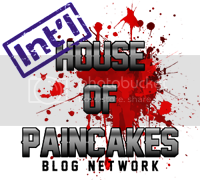 It feels like a genuine attempt to promote the hobby. I will probably buy next month's, too, to see how it stacks up. If it's impressive, I might even consider getting the digital subscription. Despite the advertisement nature of Weekly, I found it to be the better publication. I agree, it took me about 10 minutes to read Visions. I remember WD of the 80s and 90s being something that would occupy most of a rainy day. Sad. They're pretty upfront about it really being a lookbook. Lookbooks are not supposed to have a lot of content- nor did I expect that to be the case with Visions. I appreciate that they're at least trying to promote the hobby again. I feel Visions is a solid step to that end. Great positive review. I'm going to share it with the tale of painters' Facebook page. It's nice to see a review that isn't tearing into GW for the sake of tearing into GW. It's a nice honest review and I'm glad to finally see one. I have yet to pick up either version of the new WD but I very well may the next time I'm in a shop now. Well done! it just feels like another poorly thought out cash grab. Less content altogether for about 3x the cash. How is a book of pictures with no fluff, stories or anything going to introduce people to the hobby? How is WD supposed to interest gamers when I can't subscribe to it or buy it in a news agent? So I have to go to a GW store to buy it? A one man store that is closed at lunch times when I am free, as well as shut completely on two days a week? The weekly WD should be the one in the news stands and the monthly picture book available for collectors at the GW shop. Its just mental, yet another disaster from the management geniuses at GW. Visions), excluding the photo portion of Visions. Visions, on the other hand, is clearly geared towards us, the ones who already know and love the games. I'm stoked they're making a magazine with just us in mind. Thanks! I definitely recommend checking out Visions, especially if you enjoy painting. The quality of the photos and details are really great. I do enjoy painting and having a big magazine of cool stuff to look at is fine by me.